MaKendra Umstead (center), a PhD student in cancer biology, has been awarded the first Kharen Fulton Diversity Graduate Award. She is pictured here with (from left to right) Jamal Fulton, Kharen Fulton's son; Laney Dean Lisa Tedesco; Laney alumni Kai Jackson Issa and Donna Akiba Harper; and Damon Williams, director of diversity, community and recruitment. 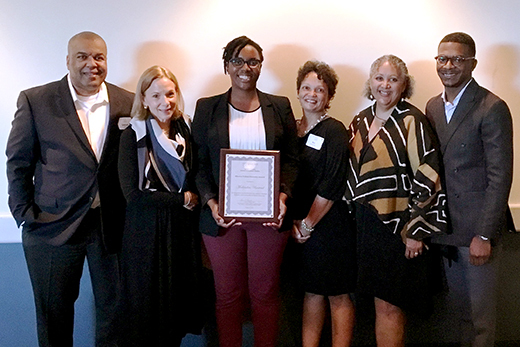 MaKendra Umstead, a Laney Graduate School student in the cancer biology doctoral program, has been awarded the first Kharen Fulton Diversity Graduate Award. Named to honor the legacy of Fulton, the longtime director of recruitment, diversity and admissions at the Laney Graduate School, the award supports graduate student diversity, inclusion and community. Umstead was presented the award at the annual Laney Graduate School Diversity Reception. A monetary prize accompanied the award. Umstead says the award came as a complete surprise. “I found out that I received the Kharen Fulton Diversity Graduate Award on the same day that I passed my private dissertation defense," she says. Fulton’s service to Emory was distinguished and long, stretching more than 30 years. The award was established through the efforts of several Laney alumni whose lives Fulton touched. In their call for support for the award, alumni Kai Jackson Issa 99G and Donna Akiba Harper 85G 88G noted Fulton’s place in their graduate careers and lives. “She understood the unique challenges that many faced as first-generation and underrepresented minority doctoral students entering academic and research fields where there were few people who looked like us. She believed that our voices and scholarship had important contributions to make in the world and reminded us of that often," they explain. For Umstead, honoring Fulton’s legacy is a call to action.